On July 24, Southern California Gas Company (SoCalGas) issued a system-wide curtailment order for electric generators and advised noncore customers (mostly large industrial and power consumers) to watch for updates and additional information. 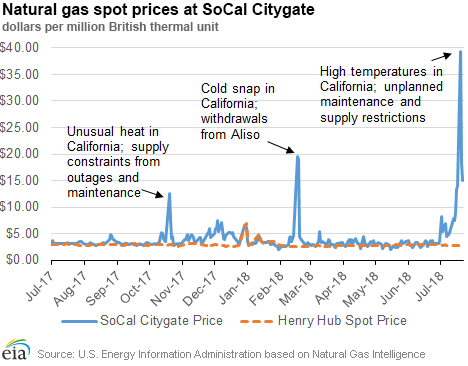 Prices at the SoCal Citygate with delivery into Southern California sharply increased late last week, and SoCalGas announced a system-wide curtailment watch on July 19. The curtailment watch, which applied to both SoCalGas and San Diego Gas and Electric customers, would last “until further notice.” The curtailment watch followed an earlier curtailment watch that lasted from July 6 through July 9 because of similar extreme weather conditions at that time. Late yesterday (Wednesday, July 25), SoCalGas announced an end to their voluntary curtailment, noting that temperatures were not as high as projected. Southern California has experienced unusually hot temperatures beginning earlier this month, which has increased demand for natural gas in the electric power sector. This increased demand is paired with supply constraints, unplanned maintenance, reduced electricity generation from hydroelectric power, and restricted storage activity at SoCalGas’s Aliso Canyon field. From July 1–24, 2018, total receipts into Southern California have averaged 2.5 billion cubic feet per day (Bcf/d). Over this same time period, whenever sendout exceeded 2.6 Bcf on any given day, SoCalGas made net withdrawals from storage inventories. Receipt points in the Northern Zone, including Needles and Kramer Junction, have been at or near capacity. Similarly, S&P Global Platts estimates that flow capacity into SoCalGas’s Southern Zone is about 730 million cubic feet per day (MMcf/d), and that flows have been at or above capacity in recent days. 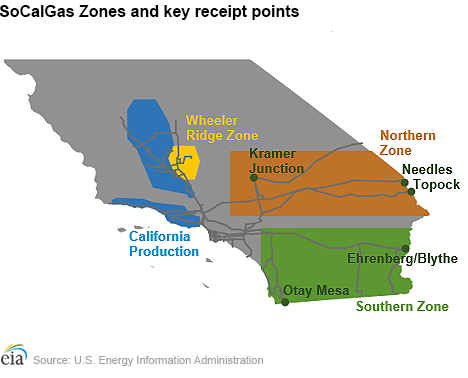 In late May, SoCalGas resumed natural gas imports from Mexico at Otay Mesa, which serves as a more expensive, marginal source of supply for Southern California. Typically, receipts at Otay Mesa are zero or very close to zero, but they reached as high as 85 MMcf/d this week, and reached similar levels when the region experienced warmer temperatures earlier this month. These imports are likely sourced from regasified volumes supplied by liquefied natural gas (LNG) imports into Energía Costa Azul in Baja California, Mexico, according to Genscape. The most recent curtailment watch was followed by a Flex Alert issued by the California Independent System Operator for July 24 and July 25 asking customers to conserve electricity for the impending heat wave this week. The National Oceanic and Atmospheric Administration’s short-term weather outlook indicates a high likelihood of above-normal temperatures in the coming days. The outlook forecasts temperatures near or above 90° Fahrenheit (°F) into early August. You can view additional data, graphics, and commentary about Southern California at EIA’s Southern California Daily Energy Report. Natural gas spot prices rose at most locations this report week (Wednesday, July 18 to Wednesday, July 25). The Henry Hub spot price rose from $2.72/MMBtu last Wednesday to $2.77/MMBtu yesterday. At the New York Mercantile Exchange (Nymex), the August 2018 contract price rose 5¢ from $2.721/MMBtu last Wednesday to $2.775/MMBtu yesterday. Net injections to working gas totaled 24 Bcf for the week ending July 20. 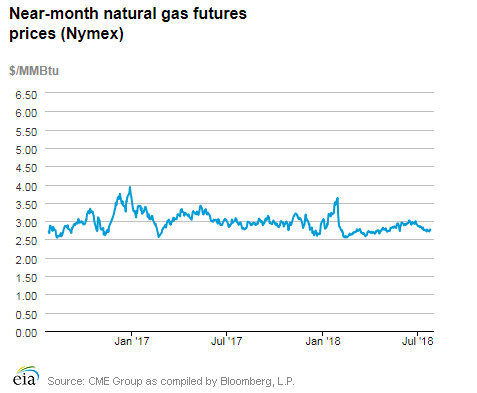 Working natural gas stocks are 2,273 Bcf, which is 24% lower than the year-ago level and 20% lower than the five-year (2013–17) average for this week. 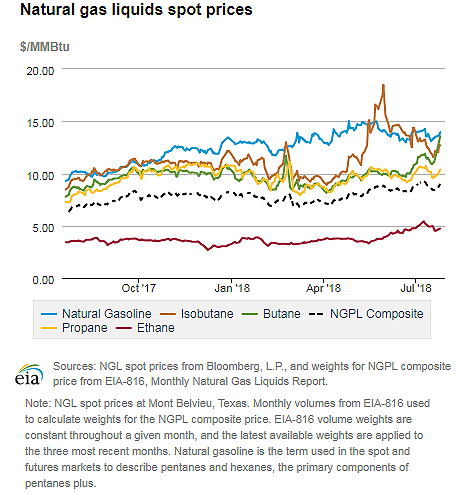 The natural gas plant liquids composite price at Mont Belvieu, Texas, rose by 2¢, averaging $8.66/MMBtu for the week ending July 25. The price of ethane fell by 7%. The price of natural gasoline and isobutane both rose by 2% while the price of butane rose by 11%. The price of propane remained flat week over week. 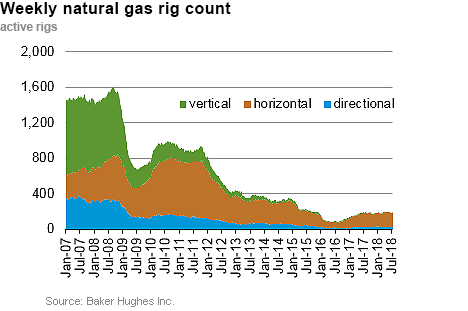 According to Baker Hughes, for the week ending Tuesday, July 17, the natural gas rig count decreased by 2 to 187. The number of oil-directed rigs fell by 5 to 858. The total rig count decreased by 8, and it now stands at 1,046. Prices rise across most of the Lower 48 states. This report week (Wednesday, July 18 to Wednesday, July 25), the Henry Hub spot price rose 5¢ from $2.72/MMBtu last Wednesday to $2.77/MMBtu yesterday. At the Chicago Citygate, prices increased 3¢ from $2.66/MMBtu last Wednesday to $2.69/MMBtu yesterday, with a low of $2.58/MMBtu on Monday. Prices in California were affected by a combination of hot temperatures and regional system constraints (see In the News). The price at SoCal Citygate increased $5.95 from $9.07/MMBtu last Wednesday to $15.02/MMBtu yesterday. It reached a high of $39.24/MMBtu on Monday, the highest nominal price since the beginning of Natural Gas Intelligence’s price data in October 2008. Prices at PG&E Citygate in Northern California rose 21¢, up from $2.96/MMBtu last Wednesday to $3.17/MMBtu yesterday. However, this point did not experience the same price spikes that occurred in Southern California. Texas prices unaffected by record heat. Texas experienced record temperatures during the report week, which led to record levels of electricity demand. Despite this demand, natural gas prices in Texas were relatively unaffected. Prices at the Houston Ship Channel fell slightly, going from $2.89/MMBtu last Wednesday to $2.85/MMBtu yesterday. Prices at the Waha hub in West Texas averaged 52¢/MMBtu lower than those at the Henry Hub last Wednesday. Yesterday, this differential was 93¢/MMBtu. 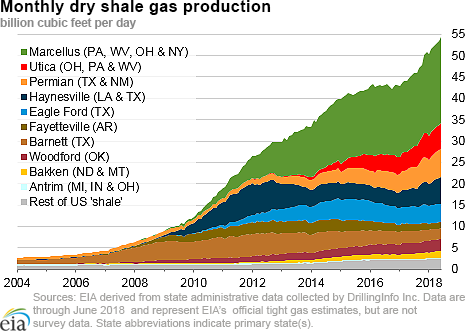 High levels of associated-dissolved natural gas production―natural gas produced as a byproduct from oil wells―in the Permian Basin have led to pipeline capacity constraints out of the region and a sustained price discount to the Henry Hub. Northeast prices increase with rising temperatures. Temperatures in the Northeast rose at the end of this report week after cooler weekend weather, increasing regional cooling demand. At the Algonquin Citygate, which serves Boston-area consumers, prices went up 11¢ from $2.71/MMBtu last Wednesday to $2.82/MMBtu yesterday after a low of $2.63/MMBtu on Thursday and Friday. At the Transcontinental Pipeline Zone 6 trading point for New York City, prices increased 5¢ from $2.83/MMBtu last Wednesday to $2.88/MMBtu yesterday, with a low of $2.71/MMBtu on Friday. Tennessee Zone 4 Marcellus spot prices increased 1¢ from $2.25/MMBtu last Wednesday to $2.26/MMBtu yesterday, with a low of $2.16/MMBtu on Monday. Prices at Dominion South in southwest Pennsylvania rose 4¢ from $2.37/MMBtu last Wednesday to $2.41/MMBtu yesterday. Nymex prices rise. At the Nymex, the price of the August 2018 contract increased 5¢, from $2.721/MMBtu last Wednesday to $2.775/MMBtu yesterday. The price of the 12-month strip averaging August 2018 through July 2019 futures contracts climbed 5¢ to $2.784/MMBtu. Despite an increase in dry production, total supply remains flat. 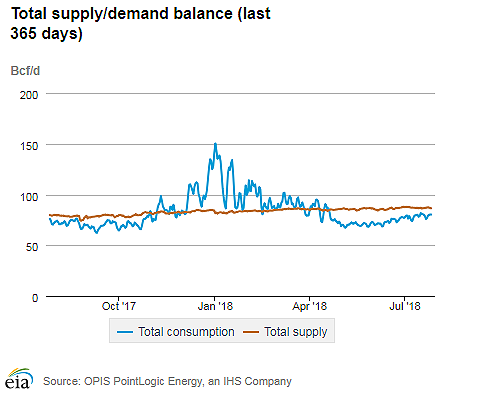 According to data from PointLogic Energy, the average total supply of natural gas remained the same as in the previous report week, averaging 86.9 Bcf/d. Dry natural gas production grew by 1% compared with the previous report week. Average net imports from Canada decreased by 5% from last week. Demand falls. Total U.S. consumption of natural gas fell by 2% compared with the previous report week, according to data from PointLogic Energy. More moderate temperatures in the northern half of the Lower 48 states, primarily over the weekend, led to a 6% week-over-week decline in natural gas consumed for power generation. Residential and commercial consumption increased by 15% (1.0 Bcf/d) week over week. Industrial sector consumption increased by 1% week over week. Natural gas exports to Mexico decreased 1%. U.S. LNG exports are flat week over week. Six LNG vessels (combined LNG-carrying capacity 21.4 Bcf) departed the United States from July 19 through July 25 (four from the Sabine Pass liquefaction terminal and two from Cove Point). Two LNG tankers (combined LNG-carrying capacity 6.8 Bcf) were loading on Wednesday, one at Sabine Pass and one at Cove Point. Net injections fall lower than the five-year average for the fourth week in a row. Net injections into storage totaled 24 Bcf for the week ending July 20, compared with the five-year (2013–17) average net injections of 46 Bcf and last year's net injections of 19 Bcf during the same week. Working gas stocks totaled 2,273 Bcf and are now 557 Bcf lower than the five-year average and 705 Bcf lower than last year at this time. Working gas stocks are on pace to end the refill season lower than the five-year range. Net injections into storage are 19% lower than the five-year average rate so far in the 2018 refill season. If working gas stocks match the five-year average rate of injections of 9.6 Bcf/d for the remainder of the refill season, inventories will total 3,258 Bcf on October 31, almost 300 Bcf lower than the five-year low of 3,560 Bcf. In the Lower 48 states, total working gas stocks are currently 29 Bcf higher than the bottom of the five-year range, but 12 Bcf and 46 Bcf lower than the five-year range in the East and Midwest regions, respectively. The South Central region posted working gas stocks that are 90 Bcf higher than the bottom of the five-year range. Despite relatively low storage inventories, the average January 2019 futures contract price traded at a lower premium to the average spot price than last year at this time. Price differences between the spot price and the futures prices at the Nymex indicate limited economic incentives for net injections into working gas. 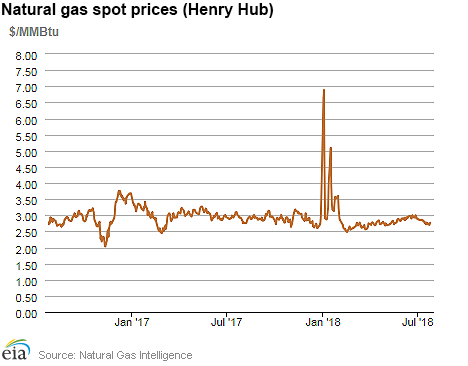 During the most recent storage week, the average natural gas spot price at the Henry Hub averaged $2.75/MMBtu while the Nymex futures price of natural gas for delivery in January 2019 averaged $2.98/MMBtu, 23¢/MMBtu higher than the spot price. A year ago, the January contract was 34¢/MMBtu higher than the spot price. Reported net injections into storage are on the low end of the range of analysts’ expections. According to The Desk survey of natural gas analysts, estimates of the weekly net change from working natural gas storage ranged from net injections of 23 Bcf to 47 Bcf, with a median estimate of 35 Bcf. At the 10:30 a.m. release of the Weekly Natural Gas Storage Report (WNGSR), the price of the Nymex futures contract for August delivery at the Henry Hub increased 2¢/MMBtu to $2.79/MMBtu, with 216 trades executed. Prices for the August contract remained close to $2.79/MMBtu. The futures contract for September delivery also posted a 2¢/MMBtu gain, rising to $2.77/MMBtu, in 989 trades executed at the release. The August contract is due to expire in trading on Friday, July 27. Temperatures are in the higher-than-normal range for the storage week. Temperatures in the Lower 48 states averaged 78 degrees °F, 3°F higher than normal and 1°F higher than last year at this time. Temperatures were also 2°F higher than the level reported for the previous week.